Home » love , reflections , relationships , TV-shows » Show Time! Recently, I've started watching two TV serials on a more-or-less regular basis. One of them is the very popular Bade Acche Lagte Hain on Sony. And the other, Kuch To Log Kahenge, again on Sony, is the remake of that old Pakistani serial, Dhoop Kinare. Yes, that same one which had that female intern doctor called Zoya, who dreamed of long hair so she could wave them around her head! Although her character in the Indian version, Dr. Nidhi Verma, already has beautiful long hair. But that's just a triviality... a pointless observation on my part. What I actually want to write about in this post is about the two main relationships portrayed in these two TV shows. 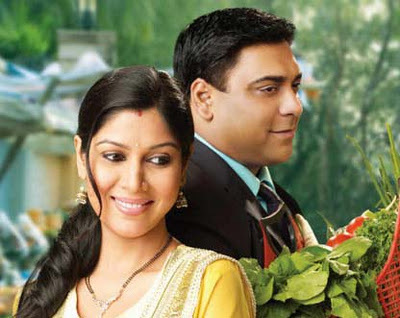 Ram Kapoor and Priya Kapoor, with less than average acting skills and dialogue delivery, keep on bickering like cats and dogs all the time. While that looked cute initially, I'm finally getting tired of it. It seems like every time she speaks to him, she nags. And every time he speaks to her, he's outright rude... and insulting even. Now "apparently", these two characters have a strong deep-rooted "understanding" otherwise. So, all this nagging and rudeness doesn't seem to affect either of them. But, I, honestly, can't imagine myself in such a relationship for any length of time. Occasional "nok-jhok" is fine, but such constant "word war" all the time... that's outright mean! And no, it doesn't translate to being witty, not when it goes on ALL the time! Besides, aren't there so many other ways of battling your wits against each other? Is it really necessary to be so rude and hurtful all the time? The relationship between Dr. Ashutosh and Dr. Nidhi is more of my taste. Innocent persuasion instead of nagging. And silent appreciation instead of rude criticism. No verbal declarations of everlasting love. And yet, their actions speak volumes. She going beyond her comfort zone and making tea for him. He wearing the yellow t-shirt she gifted, in complete contrast with his normally colorless world. A very visible desire to mold themselves for the other person's happiness. And why not? What's wrong in it? If it makes that special someone happy, then what's the harm in doing it? Inflexibility, ego, stubbornness... these words aren't synonymous with love at all. That being said, these two adorable characters are currently going through a rift in their beautiful relationship. A rift that's been deliberately created by Dr. Ashutosh, who seems to believe he's not the right choice for Dr. Nidhi. Not that he's happy being away from her. He's just making life miserable for her, for himself, and for everyone else around him! When will people learn that it's totally absurd to involve the mind in matters of the heart? Why do people complicate relationships so much? "Why do people complicate relationships so much?"